ATHENS, Ga.– With a 45-21 victory against the Georgia Tech Yellow Jackets on Saturday afternoon at Sanford Stadium, the fifth-ranked University of Georgia Bulldogs football team retained the Governor’s Cup in Athens for the second consecutive season. With the win, the Bulldogs remain perfect at home with an 11-1 regular-season record in back-to-back years. A balanced attack with 447 total yards of offense – 285 on the ground and 162 through the air – was paired with a Bulldog defense that held the nation’s top rushing offense to 66 total yards (all rushing), four first downs and one touchdown in the first half. Sophomore quarterback Jake Fromm opened the contest with seven-straight completions, matching up with seven different receivers for a 13-for-16 final clip with 175 yards and a career-high four touchdowns. Sophomore tailback D’Andre Swift registered his fourth 100-yard rushing contest of the season with 105, complete with a touchdown. With nine tackles, the Georgia defense was paced by senior defensive end Jonathan Ledbetter, a member of a senior class that improved to 42-11, the third-best mark in school history. After scoring seven-straight touchdowns in the first half against Massachusetts last week, the Bulldogs’ first five drives resulted in a touchdown. The first Georgia possession, a 9-play, 75-yard drive, was finalized by a 5-yard touchdown from Fromm to junior wide receiver Riley Ridley. After the first Georgia defensive stop, the Bulldogs used an 11-play, 88-yard march – featuring a 39-yard rush from junior Elijah Holyfield and receptions from tight ends senior Charlie Woerner and junior Isaac Nauta – to reach the 1-yard line, where Swift fought for the touchdown and the 14-0 margin. After the Yellow Jackets’ Juanyeh Thomas returned the first 100-yard kickoff return against the Bulldogs since 1999, Georgia’s distanced itself yet again with a 6-play, 63-yard drive, highlighted by a 26-yard Jayson Stanley rush. At the 12:56 mark, the 21-7 lead was sealed by a 12-yard touchdown from Fromm to sophomore wide receiver Jeremiah Holloman. Next, Georgia took over on downs as the Bulldog defense held Georgia Tech at its own 44-yard line, highlighted by a tackle from Ledbetter for a 3-yard loss and a sack from freshman defensive lineman Jordan Davis for a 4-yard loss. On the following play, Georgia took control on offense, and Fromm found junior wide receiver Mecole Hardman feet from the end zone for the 44-yard touchdown and the 28-7 lead. After another Bulldog stop, Georgia needed just four plays, split between freshman tailback James Cook and Swift, before Holyfield leaped into the end zone, extending the ball across the plane for the 8-yard touchdown. With 48 seconds remaining in the half, the Bulldogs marched 40 yards between a 13-yard Swift rush and three-straight Nauta receptions to set up a Rodrigo Blankenship 25-yard field goal. Georgia headed into the half with a 38-7 advantage. 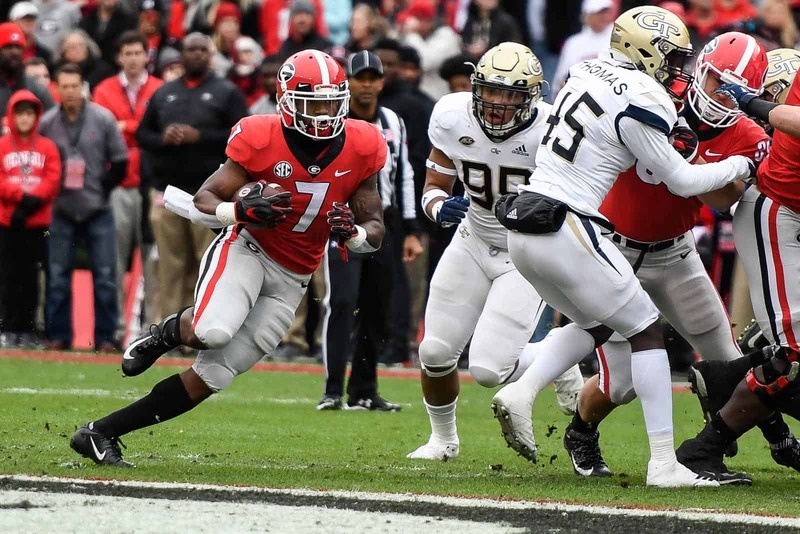 After the Bulldogs forced a three-and-out to open the second half, six plays and 53 yards later, Georgia produced a 45-7 score. Swift checked in with 39 yards on two carries, setting up a 4-yard Ridley touchdown, his career-topping second of the day, from Fromm between a pair of Georgia Tech defenders. The Yellow Jackets tacked on a pair of touchdowns in the final quarter, but the Bulldogs’ 45 points held till the 45-21 final. Next up, the Bulldogs head to Mercedes-Benz Stadium for the SEC Championship in Atlanta against the top-ranked Alabama Crimson Tide on Saturday, December 1. *42nd Win For Seniors And 11th This Year: With today’s 45-21 victory, the Bulldog senior class improves to 42-11 and that tally ranks tied for third in school history with the 2004 class that went 42-10. Georgia went a perfect 7-0 at home this year. ​For the fourth time in school history since a 12th-game was added to the season in 2002, Georgia has won at least 11 games in the regular season. Georgia has gone 11-1 during the regular season in 2002, 2012, 2017 and now 2018. In the series history with Tech, Georgia improves to 67-39-5 all-time and retains the Governor’s Cup Trophy. It was presented to Georgia coach Kirby Smart and the Bulldogs at midfield after the game by Governor Nathan Deal. *Bulldogs Strike First – & Often: Georgia scored touchdowns on its first five possessions and six out of its nine times with the ball and added a field goal during its 11thwin of the year. This comes after the Bulldogs scored touchdowns on all seven possessions in the first half last week versus Massachusetts and then scored on four of five drives during the second half against the Minutemen. Georgia’s first punt came in the 4thquarter, a span of seven quarters dating back to the Auburn game after not punting last week against UMass. *Fromm Directing The Rout: Junior QB Jake Fromm started the game 7-for-7 (12-for-12 counting the UMass game) and hit seven different receivers and went 13-for-16 for 175 yards and a career-high four touchdowns in a little more than a half. He hit junior WR Riley Ridley for a 5-yard touchdown to cap the opening nine-play, 75-yard drive that took 4:37. Fromm then directed an 88-yard drive (second longest drive this season) that lasted 6:07 and was 11 plays. Junior TB D’Andre Swift scored on a 1-yard plunge on the second drive and had 20 yards on the ground. Fellow TB Elijah Holyfield jumpstarted the drive with a 39-yard rush. 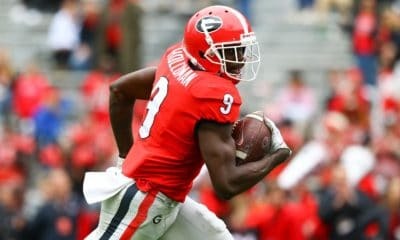 On Georgia’s third and fourth possessions, Fromm sent scoring strikes to sophomore Jeremiah Holloman for 12 yards and to junior Mecole Hardman for 44 yards. Holyfield returned to the Sanford Stadium end zone for the second time in as many weeks for Georgia’s fifth touchdown on an 8-yard scamper. Junior PK Rodrigo Blankenship completed the scoring with a 25-yard field goal as time ran out in the second quarter. In the second half, Ridley snagged his career high second touchdown grab of the game with a 4-yard catch. 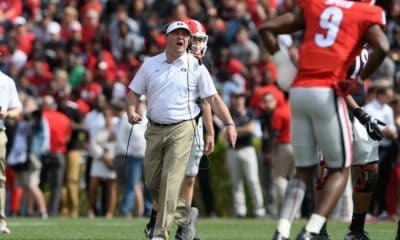 *Another Productive Day: Georgia featured a balanced attack with 448 yards of total offense including 286 yards rushing and 162 yards through the air. The Bulldogs had four receiving touchdowns and two scoring runs. Junior TE Isaac Nauta led the receivers with four catches for 36 yards while Swift led the charge on the ground with 105 yards on 14 carries (7.5 avg.) and a touchdown. This marks his fourth 100-yard rushing game in the last five contests after he played a minimal number of snaps during the 66-27 victory over UMass. 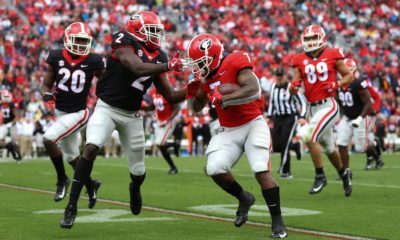 *Getting Defensive: Matched up versus the nation’s top rushing offense, the Bulldogs held Georgia Tech to 66 total yards (all rushing) and only seven points in the first half off a kickoff return. Tech finished with 219 total yards (128 rushing) and 21 points in the game. Tech was averaging 353.7 yards per game on the ground and 437.5 total yards. The Yellow Jackets completed the game with 12 first downs to Georgia’s 25. Tech went 3-for-6 on fourth downs. Senior DL Jonathan Ledbetter led the Bulldogs with a nine stops and Georgia had three sacks. Senior ILB D’Andre Walker (7 tackles) and Jordan Davis (3 tackles) each had a sack. Tae Crowder and Malik Herring split a sack in the first half. Walker’s previous high was six tackles against GT last year. *Giving Up A 100-Yarder: After the Bulldogs jumped out to a 14-0 lead, the Yellow Jackets’ Juanyeh Thomas returned Rodrigo Blankenship’s kickoff 100 yards for a touchdown. This was the first KOR for a TD since North Carolina’s T.J. Logan went 95 yards to the end zone in 2016. Tennessee’s Leonard Scott was the last player to go 100 yards for a touchdown on a KOR against the Bulldogs in 1999. Also on special teams, freshman P Jake Camarda had his first punt since the third quarter of the Auburn game on Nov. 10. He had a 45 yarder at the beginning of the fourth quarter, and it was the only one of the contest. *Protecting The Pigskin: With one fumble today, Georgia is now +3 in turnover margin. The Bulldogs have forced 15 turnovers that have led to 51 points. Their opponents have forced 12 turnovers that have resulted in 30 points. Freshman TB James Cook fumbled the ball in the fourth quarter and Tech converted it into a touchdown. *For Starters: Georgia had a pair of first-time starters on defense. 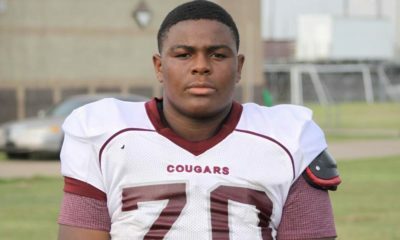 Sophomore defensive lineman Malik Herring and junior defensive lineman Michael Barnett got the nod for the Bulldogs. Senior C Lamont Gaillard started his team-leading 40thconsecutive game while on defense, junior J.R. Reed started his unit-leading 27thstraight time. *Up Next: The No. 5 Bulldogs (11-1, 7-1 SEC) make the trip to Atlanta to face No. 1 Alabama (11-0, 7-0) in the SEC Championship Game next Saturday. CBS will televise the matchup at 4 p.m. The Iron Bowl kicks off today at 3:30 p.m. to close out the regular season for the Crimson Tide versus Auburn.